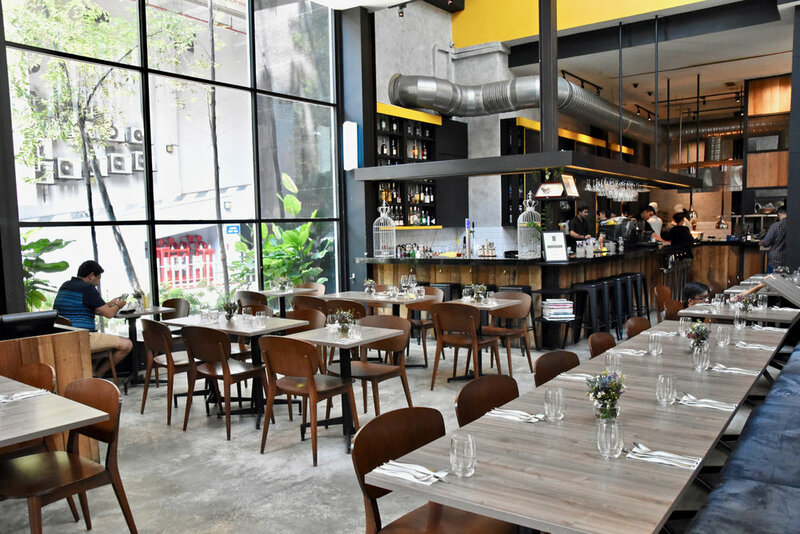 Situated in Fraser Place in the heart of bustling Kuala Lumpur, Skillet@ 163 is a breathtaking Modern European Restaurant with an outstanding bar. The restaurant interior seamlessly combines contemporary design with comfortable furnishings to create a relaxed ambience. The open kitchen adds theatre to the dining experience, allowing diners to glimpse the technical mastery within. Under the capable hands of Chef Raymond Tham the restaurant is a well oiled machine that continues to reach new heights in fine dining. The award winning menu captures the beauty of the Malaysian harvest using a ‘farm to plate’ philosophy from local suppliers combined with seasonal European ingredients. Tham graduated in Westminster Kingsway, London and his career boasts stints at the Wentworth Golf Club, Surrey UK as well as Fairmont Southampton, Bermuda before returning to his homeland Malaysia to be closer to his family. In Malaysia Tham's passion for gastronomy continued to grow and was cultivated through his roles as a culinary lecturer at a local university and technical advisor in Barry Callebaut. This was further supported by a group of friends who loved to dine and travel around the world. Through these experiences, Tham realised there was a gap in the dining scene - a restaurant which celebrates Malaysian flavours with finesse using European techniques but without all the pretention and Skillet@ 163 was born. Two years on and the eatery is truly the embodiment of fiery Malaysian flavours that boasts refinement within a casual ambience. 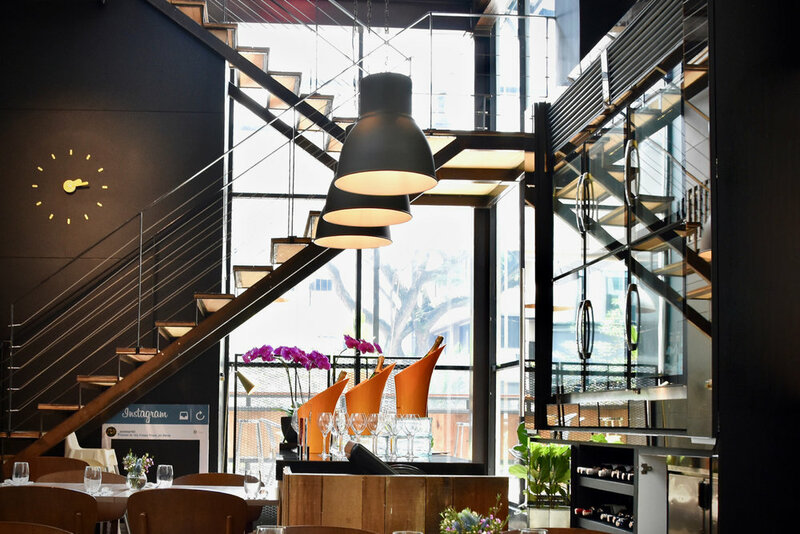 The success of the restaurant is evidenced by its recent awards as the Best of European Restaurant in Malaysia in 2015 and the Best independent restaurant in Malaysia in 2016. We loved tasting our way through the dinner degustation. Each course was perfectly matched with wine, cocktails and even a heady Hennessy VSOP to finish! To start, a delicious Amuse Bouche of Scotch Egg (but not as you know it) whetted our appetites. Skillet's version featured a soft centred quail egg, minced chicken meat with lemon grass and local herbs, pickled torch ginger flower and was finished with Asian dressing. To follow a stunning appetiser of Alaskan king crab graced our presence. We loved the perfectly cooked crab which went beautifully with slightly tart kedondong granite, luxurious avocado cream, sago and squid ink puff, nashi pear and ice plant. The kedondong (a common local plum) was certainly an interesting local ingredient to add to the mix and we loved how Tham used the acidity and sweetness of the kedondong to balance the savouriness of the crab. One of our favourite dishes was the Black chicken rillettes and foie gras dumplings served with morel consommé. A Chinese New Year inspired creation, the dumplings were delicately made and wonderfully flavoursome without outshining the flavour-laden consommé which had a great depth of flavour. In the lead up to mains, a dish of decadent Duck foie gras was a welcomed sight. We loved this unique preparation of foie gras which was served with aromatic curry leaf tempura and beautifully sweet prune and cardamom compote combined with raspberry coulis. This dish was inspired by Malaysia's melting pot for culture and races and was a clever Indian-inspired take on the traditional foie gras dish. For mains the Chinese five spice duck breast and confit duck leg served with foie gras croquette impressed. 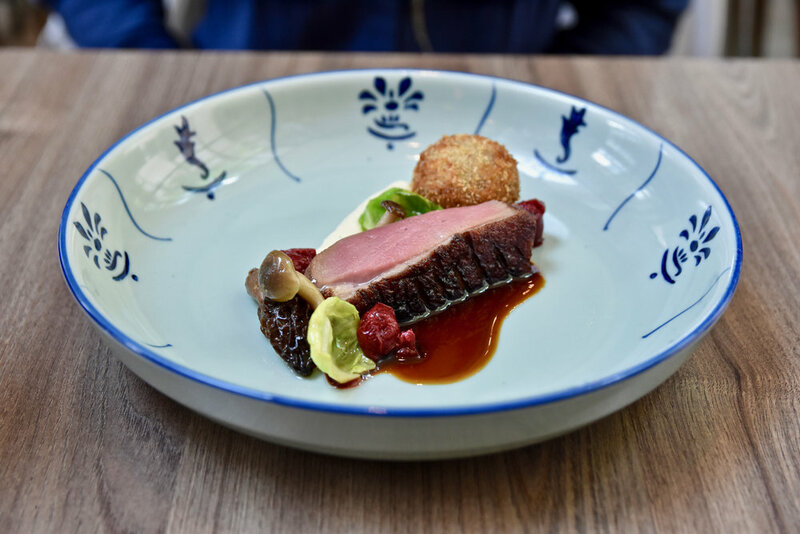 The duck was cooked to perfection - crispy skin with the underlying meat wonderfully tender, allowing its natural rich flavours to shine through. Cherry jus and a beautiful parsnip puree provided the crowning element to this luxurious dish. It was beautiful. The final savoury course of "Bourguinon" continued the trend of deliciousness. A Malaysian take on a French classic, wagyu beef cheeks had been slow cooked for 36 hours and served with "Lo bak" wagyu beef sausage which was encased within beancurd skin and served with white asparagus and laced in red wine jus. Delicious! Dessert time is theatrical at Skillet@ 163 beginning with table side freshly churned sorbet using liquid nitrogen. 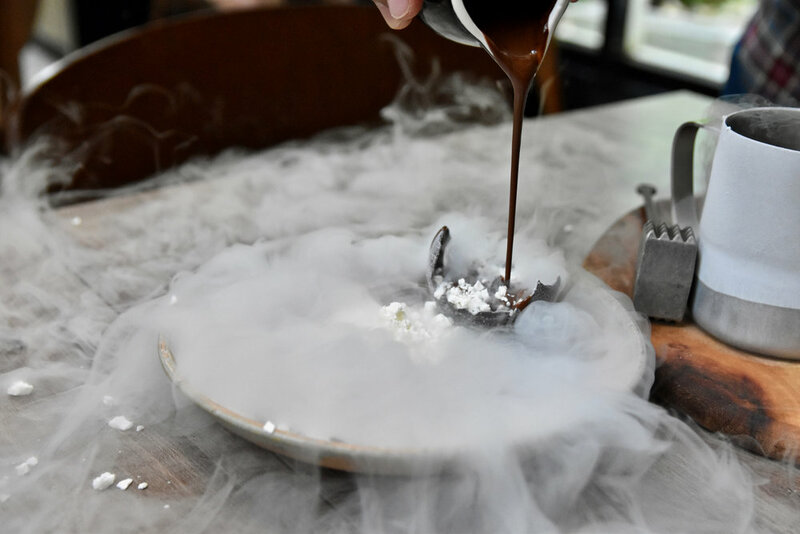 This was followed by a dessert aptly named "Textures of chocolate" - A chocolate lovers dream comprising of a chocolate sphere, chocolate and cocoa soil, white chocolate "pop-corn" and more liquid nitrogen. When it comes to chocolate, Tham is an expert and it shows in the execution of the dish. Once a technical advisor for Barry Callebaut overseeing their European brands of chocolate Tham was also one of the judges for the World chocolate master selection in Taiwan. So it's really no surprise that this dessert was superb. Picture perfect in appearance and even more outstanding in taste. 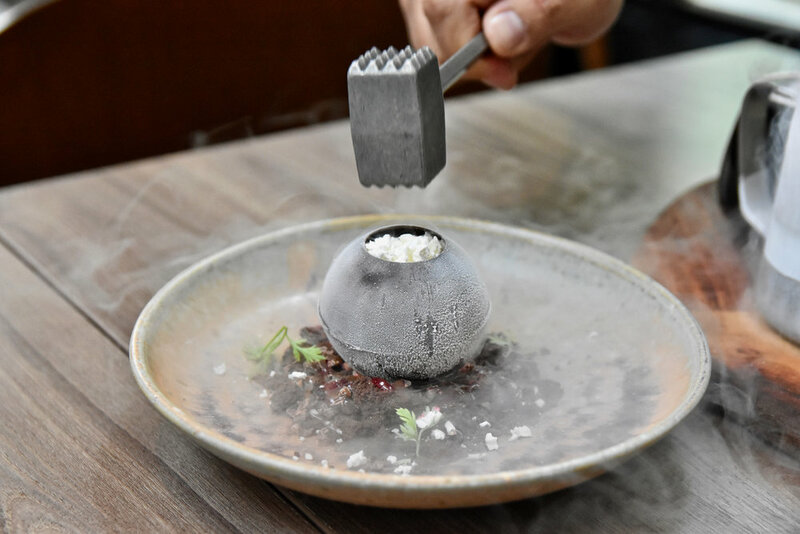 Skillet@ 163 amazes by serving the finest locally grown and internationally sourced food, exquisitely prepared and beautifully presented within a relaxed, elegant and thoroughly modern environment.